Just four points separate the top six sides in the South of Scotland league after last weekend’s action packed encounters. Heston Rovers beat Annan Athletic 3-2 to move to fifth in the table only three points off leaders Bonnyton Thistle. Rovers stormed into a three-goal lead before the break with a double from Boyd and a single from Milligan. Annan pulled a goal back on 67 minutes and they were some nervy times before the end when they netted a second with 12 minutes to go though they were unable to find an equaliser. Connor Smith struck twice for Bonnyton in their 2-2 draw with Lochmaben. 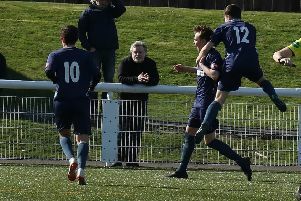 Conor Murray and an own goal gave the visitors a point, but Bonnyton’s healthy goal difference – some 17 goals better off than second-placed St Cuthbert Wanderers – ensured they remained at the summit. St Cuthbert are breathing down their necks after a fine 3-1 win over Newton Stewart. Blair Dougan, Ally McMillan and Kyle McDonald were all on the scoresheet for the Kirkcudbright side, who moved level on points with Bonnyton having played a game more. Robert Middleton grabbed a consolation for Newton who slipped to seventh. A late winner from Connor Graham gave Mid Annandale a narrow 1-0 win over Nithsdale Wanderers to move them sixth after the Wanderers had missed a penalty with five minutes remaining. Meanwhile, the games between Creetown and Stranraer, and Threave Rovers and Abbey Vale were postponed. Tonight (Friday) Newton Stewart host Queen of the South youngsters at Blairmount Park in the Challenge Cup, kick off 7.30pm. Saturday’s Cup fixtures 2pm unless stated: Edusport v Bonnyton, Lochar v St Cuthbert Wanderers, Mid Annandale v Stranraer (3pm), Upper Annandale v Abbey Vale, Wigtown and Bladnoch v Lochmaben (3pm). League: Creetown v Threave.